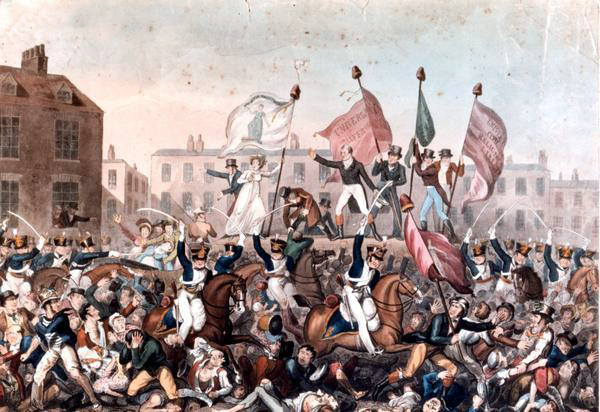 The ‘Peterloo Massacre’ was a defining event in popular politics in nineteenth-century Britain. On 16 August 1819, Processions of men, women and children dressed in their Sunday best, led by brass bands and the radical societies bearing laurel leaves and their local banners, wove into Manchester from all the surrounding towns and villages. About 60,000 people attended a peaceful reform meeting, addressed by Henry ‘Orator’ Hunt, in St Peter’s Fields. The magistrates ordered the yeomanry to arrest the speakers on the hustings. Cutting through the crowd with sabres and bayonets, the soldiers caused about 18 deaths and over 650 severe injuries. Women were over-represented in the casualty lists. 1819 was the first year that women had formed their own societies to campaign for parliamentary reform. Their leaders had placed themselves near the hustings in order to take a visible and active part in the proceedings, and the troops seem to have targeted them deliberately. The scale of the event by no means matches twentieth and twenty-first century massacres by governments or rebel forces of their civilians. But Peterloo, and the other democratic and workers’ movements discussed in my book, still matter. The repercussions of the event defined the nature of both subsequent government legislation against protest and reformers’ attitudes towards the authorities. The freedom to protest in public space was and is defended to the death. 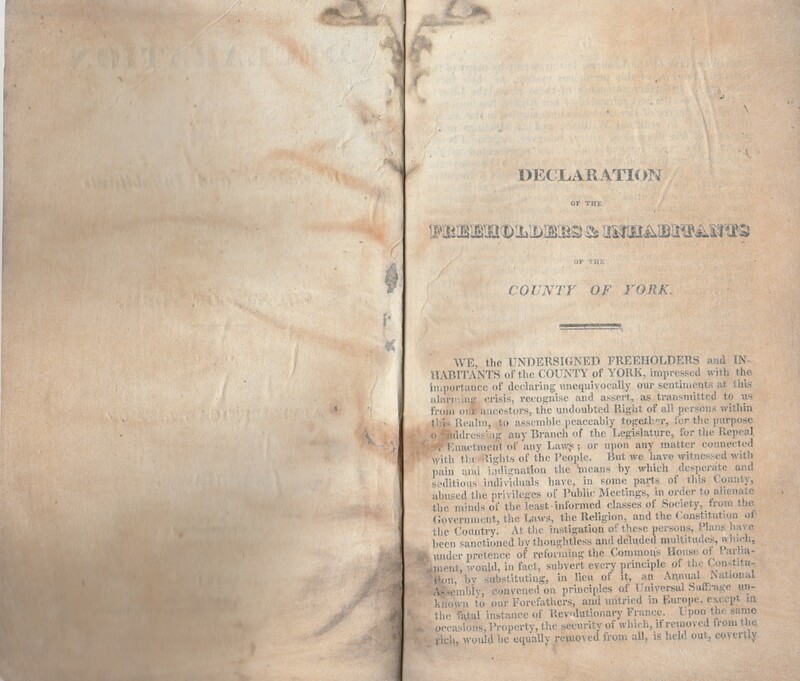 The account book of the relief fund for the victims and families of the massacre is in the John Rylands Library, Manchester, and has been entered into the UNESCO UK Memory of the World register. Controversy over the form and positioning of a memorial to the victims of Peterloo in Manchester has continued to the present day. On the cavalry drawing up they were received with a shout of good-will, as I understood it. They shouted again, waving their sabres over their heads; and then, slackening rein, and striking spur into their steeds, they dashed forward and began cutting the people. “Stand fast,” I said, “they are riding upon us; stand fast.” And there was a general cry in our quarter of “Stand fast.” The cavalry were in confusion: they evidently could not, with all the weight of man and horse, penetrate that compact mass of human beings; and their sabres were plied to hew a way through naked held-up hands and defenceless heads; and then chopped limbs and wound-gaping skulls were seen; and groans and cries were mingled with the din of that horrid confusion. “Ah! ah!” “for shame! for shame!” was shouted. Then, “Break! break! they are killing them in front, and they cannot get away;” and there was a general cry of “break! break.” For a moment the crowd held back as in a pause; then was a rush, heavy and resistless as a headlong sea, and a sound like low thunder, with screams, prayers, and imprecations from the crowd­moiled and sabre-doomed who could not escape. Read the rest of Samuel Bamford’s account at: http://gerald-massey.org.uk/bamford/c_radical_%288%29.htm#XXV. Cross-Pennine support for the Peterloo victims was immediate. The impact of Peterloo quickly became a factor unifying disparate reform groups across the North, and indeed, the whole country. Common to many reactions of social movements to incidents of suppression, radicals responded firstly in stunned shock while they tried to make sense of the situation, followed by anger, which leaders sought to channel into carefully organised demonstrations of mourning combined with defiance. The bloody field of Peterloo. The defence of the right to meet in St Peter’s Fields was translated to the more general abstract idea and indeed space of being able to meet and the constitutional right to petition parliament. 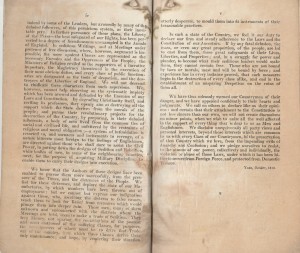 Parson Ellis, who is a Baptist minister, thrice called for silence, with the most stentorious lungs’, and despite his pleas, John Knight, when coming forward to propose the resolutions, ‘begged that the meeting would be as quiet as possible while the chairman should read them. The people still, however, continued to make a considerable noise, and there was much confusion about the hustings; when Mr Mitchell stood forward to second the resolutions, and reiterate the request for silence. The fear of another Peterloo probably tinged the solemnity with nervous agitation, and false rumours spread among the crowd that the cavalry were on the approach, causing alarm and hundreds to flee across the fields, scattering shoes and bonnets in their wake. Leeds Mercury, 9 October 1819; The Times, 7 October 1819. Loyalist elites in government and local authorities were quick to support the actions of the magistrates and yeomanry in suppressing the Manchester meeting. 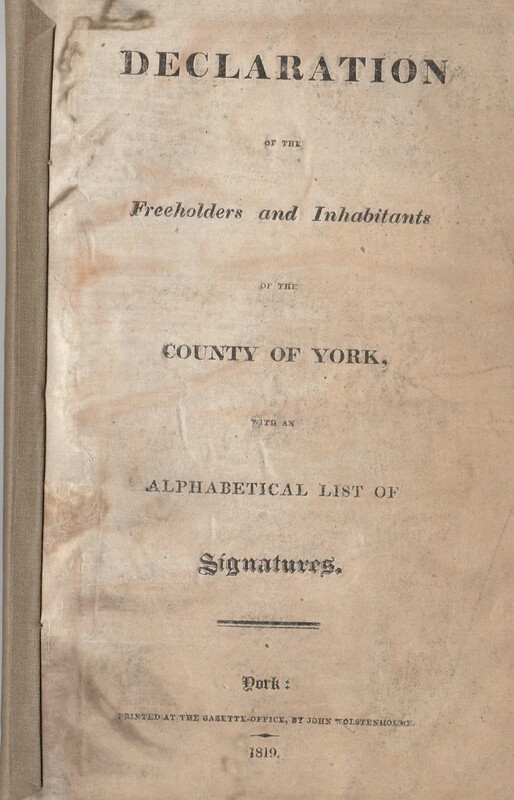 The ‘Declaration of the freeholders and inhabitants of the County of York’ was signed and published in October 1819 and was typical of the loyalist reaction to Peterloo. 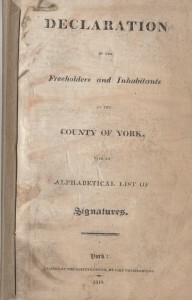 We the undersigned freeholders and inhabitants of the county of York, impressed with the importance of declaring unequivocally our sentiments at this alarming crisis, recognise and assert, as transmitted to us from our ancestors, the undoubted Right of all persons within this Realm, to assemble peaceably together, for the purpose of addressing any Branch of the Legislature, for the Repeal or Enactment of any Laws; or upon any matter connected with the Rights of the People. But we have witnessed with pain and indignation the means by which desperate and seditious individuals have, in some parts of this Country, abused the privileges of Public Meetings, in order to alienated the minds of the least informed classes of Society, from the Government, the Laws, the Religion and the Constitution of the Country. At the instigation of these persons, Plans have been sanctioned by thoughtless and deluded multitudes, which, under pretence of reforming the Commons House of Parliament, would, in fact, subvert every principle of the Constitution, by substituting, in lieu of it, an Annual National Assembly, convened on principles of Universal Suffrage unknown to our Forefathers, and untried in Europe, except in the fatal instance of Revolutionary France…. 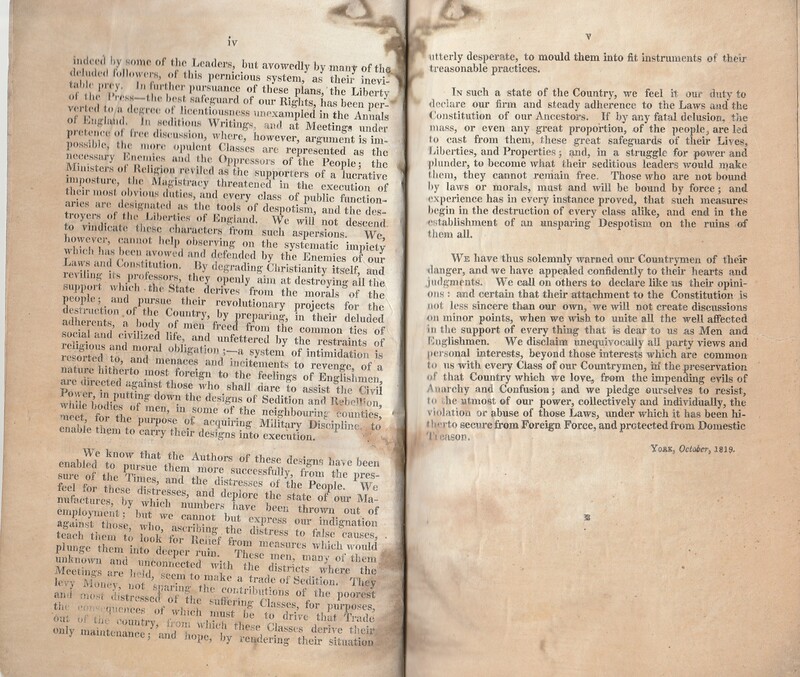 Then follows pages and pages of names appended to the declaration. Since the rise of popular radicalism in the 1790s, loyalists asserted that ‘if you’re not for us, you’re against us’. They divided the nation into supporters of the mythical ‘constitution’, the bedrock of which was property and elite rule, against anyone who supported universal suffrage and annual parliaments. They deliberately compared the supporters of democracy with the worst excesses of revolutionary France: anarchy, destruction of property and religion. The Peterloo massacre for them was proof of the revolutionary intentions of the reformers, no matter what the evidence about their peaceable intentions and legal aims showed. I am interested in purchasing the £70 hardback ‘Peterloo’ – but can’t wait for the paperback to come out as I wish to give it to a couple for Christmas. Is the Summer ’16 half price offer still available? Looking forward to hearing from you. Hi Carolyn, I think the summer offer is over, but keep checking MUP’s website as they might have an offer on at Christmas. Amazon says the paperback will be available next March, at the much more affordable price of £20.